This is a little bit of an impromptu post as I was going to just make a Twitter thread about it to get it off my chest and process what's been happening but then I was in two minds because I wasn't sure how to trigger warn or content warn it properly, so here I am. As I said, this is mostly for me and my own need to process this and get it off my chest. However, I also know I have a lot of readers that have mental health issues so if you can relate I'd love to hear from you. Yay, community! I'm very open about my mental health issues but I'm also aware of the fact that I've not really ever been formally diagnosed with anything. I think it's hard enough for anybody to be taken seriously when it comes to the GPs and the mental health system but in my experience - as I've written before - I've really struggled to have professionals see passed my disability. That means that aside from being prescribed the mini pill and then anti-depressants for my anxiety - both of which I'm no longer taking - my issues have all been managed through self care. That's why being able to talk about it on my blog and talk to others is so important to me. It's also why I really welcome any tips anyone might have on how they deal with their issues or what resources and information that might help me. Anyway, what's been happening lately! I thought I was pretty good recently. I've been pushing myself to try more things and not letting anxiety stop me socially. I even went for drinks with some relatively new friends by myself - on the day my period started, no less. While socially I've been feeling a lot better, a big source of anxiety hit me in August when I decided to transition to a plant based diet and had to scale that transition way back when it became triggering, which I talked about in this post. There was a lot of conflicting and unhealthy feelings surrounding wanting to change my diet and failing at changing my diet. So much so I had to completely put it out of my head or risk serious health implications, physical and mental. I'm still not a 100% back on track when it comes to being able to eat and enjoy food but I recently got a prescription of Fortisip to help boost my calorie intake and I'm reevaluating how to go about things. While I was trying to transition my diet, one of the things I found particularly hard was getting enough calories. It meant that when I went to bed at night I would get hungry and this hunger would make my acid reflux worse. This mixed with already heightened anxiety and probably just my body WTF because it wasn't getting enough to eat meant I became hyperaware. In the past my hyperawareness has only presented in relation to my throat and breathing, particularly swallowing. 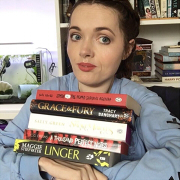 If' you've been reading my blog for a while you may remember I developed panic attacks because I felt like my throat might close over or stop working. The only way I could explain it was that I was very aware of my throat and felt like it was just wrong. For a long time I couldn't eat certain foods because I felt like I was choking. It seemed like a legitimate concern at the time as I'd read about swallowing being an issue for different kinds of Muscular Dystrophy but after testing I know my choking issue was psychological and I can now eat many of the things I used to struggle with. I still have times were I am hyperaware of my throat but it's a lot easier to manage now that I know what it is. 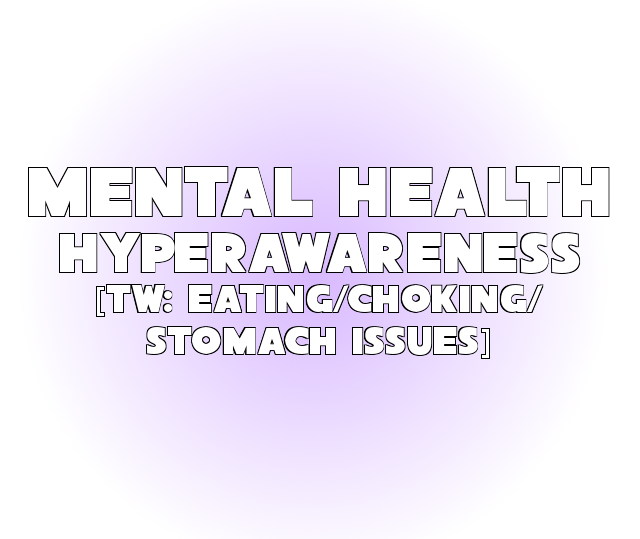 While my hyperawareness began in relation to my throat, during panic attacks I'd develop it in other areas but I think that's common. Most commonly I would feel like my skin was numb and wrong. Particularly my neck, chest and wrists. However, in August I was presented with a new source of hyperawareness - my stomach. It's a little different in the fact that with my throat it was the function of swallowing that I was hyperaware of but with my stomach it just feels wrong in itself. It's not upset or actually doing anything. Yet I still have this anxiety and hyper awareness that it doesn't feel how it should. I guess it's not surprising that I would develop this after attempting to change my diet. So far how I've been managing it is using a heat pad on my stomach. Not because it hurts or because it eases any physical feeling but the heat sort of just takes my mind off my stomach and gives me something else to focus on in that region. It's working well so far. I'm glad that you have articulated your problem/issue with hyper awareness (spelt your way). I don't think I've heard about hyper awareness before. Between the ages of 16-20 I was slowly finding food a chore, swallowing was difficult & choking was an issue. This type of hyperawareness of your body must happen frequently for disabled people, talking about it is a public service. I used to have hyper awareness regarding my bladder, the worry takes over your life & enjoyment. Thank you for speaking out so clearly.